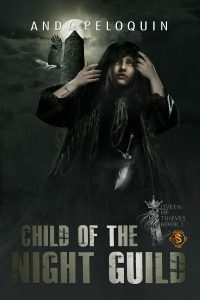 I’m hosting a guest post today for the release of “Child of the Night Guild” by Andy Peloquin. 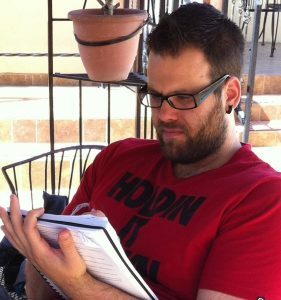 I’ll leave the word to Andy now, who talks about his process for clean manuscripts. In my (few) years of writing and submitting manuscripts to editors, I’ve had most of them tell me, “This is one of the cleanest manuscripts I’ve seen.” I attribute that to the incredibly thorough editing process I subject my books to before they’re ever turned into the publisher. The first step is sending the book off to alpha readers, people who read the first draft and give me feedback on the “broad strokes” of the story, characters, plot, plot twists, etc. I give alpha readers six weeks to read, and during that time I’m working on another project. That way, when I come back to the manuscript, it’s like I’m approaching it with fresh eyes. As I work on improving the book according to the alpha reader suggestions and feedback, I go over every sentence with painstaking care to make it as perfect as I can. I often end up rewriting large portions of the book to flesh out details, tighten up mistakes I made in the first draft, and basically cleaning everything up. My goal is to make it as perfect as possible by the time I send it off to beta readers. Beta readers will go through it and offer feedback on the story at large, but they’ll also look at the nitty gritty: show vs. tell, passive vs. active, character elements, sentence structure, grammar, flow, and all the rest. That’s another six weeks dedicated to another project while the beta readers get out their red pens and slice and dice. After the beta reading phase, I go over the manuscript and make changes according to their suggestions. I DON’T read each sentence over, but I simply edit the mistakes and make the changes they recommend. It’s a much quicker phase, allowing me to get to the next stage faster. The next, most important stage is also the last one before submitting the work to the editors. I print out the book and read it on paper. I find that the words that looked good on the computer screen often don’t read as well on paper. So this final phase helps me to really focus on the flaws that come out as I’m reading the “final” version. After I find all the mistakes on paper, I give the manuscript one more pass to correct everything. Once I’m sure it’s done and I’ve corrected all the mistakes, it’s off to the editor (where it goes through 2 additional rounds of editing before formatting and publication). Yes, this is a long, drawn-out process that takes me far longer than a writer who goes through fewer rounds of self-editing. We’re talking a total of 8-9 months of time, with around 5-6 months of solid work invested in writing, rewriting, and editing. But it leads to cleaner manuscripts with fewer errors and better all-round quality of writing. I know my readers appreciate my perfectionism! It’s crazy how much work goes into books from the writing all the way to the final copy. I’m sure it pays off in the end though, and this sounds like an interesting book!